EDIT2: Was it as good as we had hoped? I would say better. I have only seen a 720p version from itunes on my laptop but it was awesome. Fantastic episode full stop and did I forget I was watching a DSLR episode by the end? Yep! Which is EXACTLY what you want. It added to the claustrophobic atmosphere of the episode and didn’t jar once. A huge success and the beginning of major acceptance for these cameras by so many more people. EDIT: YES tonight it goes out. Wish I was in US to watch it. Am in Norway, so will have to wait until it is on itunes. The lucky ones…ENJOY! This is a massive day for DSLR filmmaking. Finally we can see the first two minutes of this much hyped (for us camera geeks) episode as it was shot on 3 Canon 5DmkIIs. I think you will agree it’s looking great despite the low non HD quality here. Check out my interview with Director Greg Yaitanes here. This is going to be EPIC. Can’t wait! 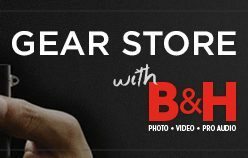 Huge step forward for the DSLR community! Gee, it’s good to know that now when I shoot something completely soft and out of focus, with weird muddy skintones the general public will not only accept it – they’ll be EXCITED about it! YAY! c’mon heavily compressed EW video here! fantastic to see that these cameras hold up just as well as the ‘proper gear’ when you throw big budget sets and lighting in front of them. not sure why they felt the need to go hand held so much though. you can really notice they’re using light cameras with some of the wobble, albeit slight. i mean, just because you can go handheld doesn’t always mean you should. right? after editing a tonne of recently shot footage DSLR, i’m learning that the hard way. anyway, it still looks amazing and i can’t wait to see the whole thing. It was nicely lit but it had some real focus problems. I feel sorry for the focus pullers as it was not their fault though. Looked like there were some rolling shutter issues as well. Of course final judgment needs to be with the broadcast version, but this was not much of a show case for the camera or the still lenses they used. It is hard to get into the emotions of an actor when their faces and especially eyes are not sharp. It was very distracting. I wonder how the actors reacted to it? personally i find the focus pulling on house to be always a tad on the sloppy side (not complaining, not saying i can do better and not saying it bothers me!).. i dont think it was any different here..
come on Nigel REALLY! you ever heard the expression “you point one finger at someone and your pointing 4 back at yourself”? I thought the season finale of House was absolutely stunning and one of the most beautiful and spellbinding television episodes I’ve ever seen, and I own a 5d mkii, so feel a bit put off by your criticality. But if you made a tv show with the 5d mkii i would love to watch that too. have a nice day. I think it looks promising. Evidently the small clip is very compressed. Broadcast will be much better even if it will only be 720 or 1080i with lots of mp4 artifacts… Too bad we can’t see it full res. I do agree that people tend to go handheld because they like the freedom but my opinion is that quality suffers when they do that (shake…rolling shutter etc ) and if I see an other “camera on the groun because I can” shot that doesn’t serve the story telling, I’m going to scream!!! Anyway, very exciting stuff. Can’t wait! C’mon guys haven’t you seen the Shield? They utilize the handheld style to its fullest and there is plenty of “wobble” in almost every scene. The Shield was shot on Arriflex SR3’s I believe. Shows like that and The Wire would have loved to have technology like this at their disposal. It is awesome to see such a major network such as NBC with a show like House fully embrace these cameras. I think this footage looks great, I love the style. It’s great to see these bad boys in actions on a show of this caliber. it’s actually FOX but yes I agree. HOUSE is FOX, which makes it even more surprising. Quite exciting, can’t say much from this compression, but I’m getting more excited. Yeah there’s way too much hand held. I’m doubtful the entire episode will be like that, but if it is good gosh. Image calls way too much attention to itself as is and not in a good way. Bourne does shaky cam the right way, if that’s what they were going for, they’ve missed the mark. Again… doubt the entire episode will look like that. same here, had to keep reminding myself to look critically, totally swept away, great photography. Well with these production values he could have shot it on a hv20 (well, ok, not really but… ) and it still would have made a big impact.I mean look at the highlights and overall mids.I’m talking about precise lighting here.With film it would propably have been way easier.I’m looking forward to that episode. But seriously, you can tell it’s going to be great. I just can’t understand why they didn’t post it at Vimeo. I think you will find the license at Vimeo would prevent use by Fox. To judge the picture quality based on that video clip is ridiculous. For comments on skin tones etc you gotta see the real thing. 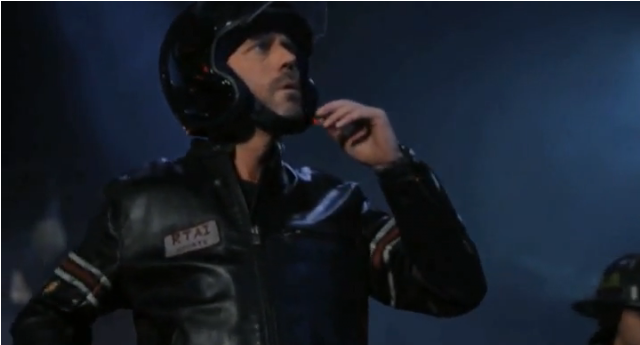 The clip did one thing clear: I need to see the episode because Im dying to know what´s going on at the crash site! These cameras do skin tones very well! Nikon and canon are pretty much in the skin tone business. Cant wait to see this, this is epic to the millionth degree! Your right, the terrible compression makes it hard to notice anything else. However, it’s nice to know that I’m not the only one who gets a little noise and banding from time to time. It will be interesting to see how it holds up on an HD TV once it airs. I’m excited because it will be the first time that I’ll see 5D MK II footage on anything other than on a computer. Also, I was surprised by how great the picture looked, knowing that they shot everything using the in camera ‘neutral’ picture profile. I would have thought they would use a custom ‘super flat’ setting of their own. Regardless, it looked great! Maybe I should start using the neutral setting myself. What do you think Philip? YouTube Version http://www.youtube.com/watch?v=yAaZZQhuyMo still not HD but a little better. I can’t beleive they even CONSIDERED shooting with the 5D. The footage is horrible! Clearly shot on a DSLR. You can see rolling shutter galore, and I have no idea why the broadcasters OKed the compressed h.264 codec. I was BLOWN AWAY! I never would have guessed that was shot on a DSLR! I can’t wait for the final episode, it’s going to be awesome! My only complaint is the excessive shaky camera, but I’m guessing it’s just for a few scenes. I came across these promotional stills from that episode, gives a little more insight into what the episode will be about (plus they are screenshots). This is truly a watershed moment in the history of filmmaking. However, equally impressive, but off many people’s radar, is a short film made by the gifted Spike Jonze. It can only be purchased on iTunes, but it’s worth every penny of its $2.99 price tag. 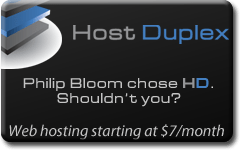 Thanks Philip again for your indispensable site. Whoops – the Spike Jonze short is entitled “We were once a fairytale”. Sorry! I cant wait to see the full version! this trailer was great i love the feel and the motion of hand held, it adds to the scene IMO. 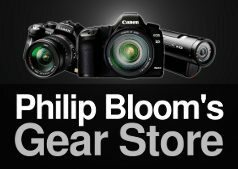 This is a great leap forward for all DSLR fans!!!!! I haven’t seen House in a while, do they normally do so many quick cuts? Aside from the last panning shot, everything felt very choppy, almost like they filmed it in 5-second snippets and then edited it all together (I know they didn’t, but it’s oddly consistent). I gotta say I find this clip really beautiful, and to be honest, I find the banding in the image really unique and special, especially the way way the colors collapse together in the office at the beginning. I think this camera looks like nothing else out there, capable of showing people things in a way they have never seen before. i think this banding reflects that. I hope some of that makes it to broadcast. can’t understand why it is not available in a decent compression, anyway it seems to be a really fine work. Cheers all! Because it’s for House fans not us! I will wait and hold my judgment until I’ve seen the whole thing on my 55″ HDTV. and the nightmare for the focus pullers. why they went with HD-DSLR’s and the “Look” they were after, and it seems they Nailed it! “Full Glory” May 17th before I make such critical judgments as other posters here have. Thank you Greg Yaitanes and Philip Bloom for sharing it with us. people,dont worry ,it will look good on TV …and average viewer doesnt give a damn ,is it 35mm,5D , U2 or B52. Wow, this is exciting. Let’s not forget that although the video in that clip looks compressed and rubbishy, it sounded great, which is always half the battle. Can’t wait until this comes out with the image at the same quality as the sound was in this preview. It’s looking really promising! The first time I watched it I was a bit meh. After watching it a second time though, I thought that it certainly is quite fresh, and intermediate with the characters. P.S. At the end of my first paragraph, instead of writing ‘characters’, I wrote ‘cameras’. DEAR GOD I’M A TOTAL GEEK! 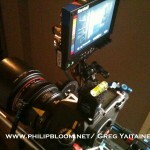 The fact that the 5D2 is being used in a high profile show is exciting. But, as many have said before me, I will wait until the airing to pass judgment. I am a huge House fan, so the story will be key for me. How it looks will just be icing on the cake…or not. My hope is that this episode will look absolutely amazing. It will go a long way in helping me sell my stuff. in the 5DMK2 as our Primary Working Camera. is glorious and the broadcast is well received by the 5d community! I’m a big fan of DSLR-video but I don’t think the camera work here is good enough. Hardware-wise I think this looks fine (hard to really tell though), but the focus issues is VERY distracting (very visible even in low res) and the handheld has to much wobble for me. Instead of pulling me into the picture I feel like it’s pushing me away and makes me very aware of the medium. lets wait to the show airs shall we? I was just judging the trailer as a standalone piece for now since that’s really all we can do at the moment. Does anybody know how they recorded audio with 5DMII? you are thinking of them like a small indie crew. They would NEVER record sound in camera on any shows, even the low budget ones. All do dual system sound. I think what gives away the (5D look) is the skin tones. There isn’t much detail in the color rendering that comes out of the 5D. The colors are flat, and its hard to grade in post. I was looking forward to see guys with large budgets, how they would handle grading, and with the low res sample I can see that they couldn’t do much. The skin tones just don’t look that great with the HDSLR’s currently. Don’t get me wrong, I love my 5D. how can anyone judge anything from this compressed youtube clip? My general impression with 5D/7D is that the skin tonal range gives it away that its been shot on HDSLR’s. Not just with this clip, overall. Personally I think they did it the wrong way round. They should have just aired the episode without telling us all it’s shot on a DSLR. That way you could appreciate it for what it is, the story, acting, cinematography. Then BAM guess what this was actually shot on a DSLR. I think the expectation now and hype might mar it and people will be looking for niggles to pick at like rolling shutter etc. But in this day and age it’s bloody difficult to keep a secret like that. I don’t know but I feel the weight of expectation has coloured it already. Aside from that I think it looks spectacular, you’d have to be hyper critical to mock the focus pulling considering the arduous nature of the shoot, and for me at least I think it adds reality to it. I shall be watching this very carefully. possibly, but i think only with the minority. 99.9% will watch it as an episode of House. Also they didnt plan on letting people know about using the 5dmkII. it slipped out! It’s almost too bad that it got out ahead of time that it was shot on a 5d. (I’m a HUGE House fan and) When I heard about this, my first thought was that they were going to do some gimmicky “un-House” “look” for the season finale. Technical details aside (i.e. focus pulls, handheld shakiness, mp4 compression, moire, rolling shutter, yada yada yada I’m boring myself), based on this clip, I am shocked at how well they were able to stay within the boundaries of the established House look, especially considering that they were coming from 35mm. Of course, I’ll reserve final judgment for the airing, but based on this, it appears to be a remarkable & encouraging achievement. I am really amused at everyone on here that is digging into this clip for shaky production values. Some of the comments here are so clearly from frustrated “wannabe” types it makes me laugh. Yeah, focus pull was slow sometimes. Yeah, very handheld in this clip. And? If I had a dollar for every film and series doing this look right now I would be way too rich to be spending my time on here getting a grin out of your criticism. Grow up and get over yourselves. The camera looks amazing. The show looks great. If it’s not your personal style — say so. But really, stop flexing like you all have the resumes to show you can do any better or even get close. Too funny. yup, focus is dodgy at times no doubt, and handheld can get distracting. 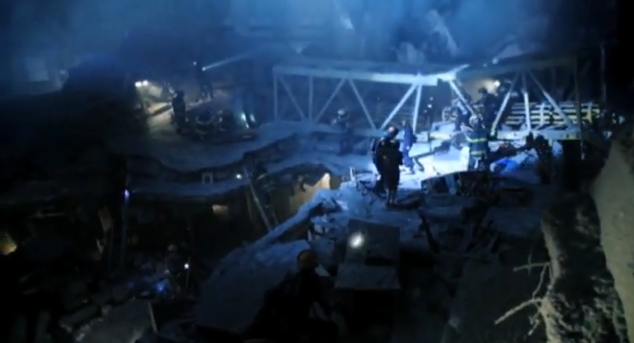 but, ummmmm…did anyone notice the completely collapsed building and the great crane shot? The great lighting? The disjointed editing to begin the story, a bit odd on network TV? 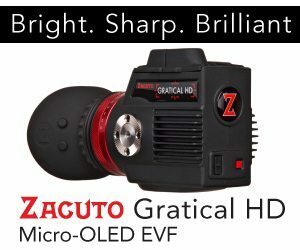 Strangely critical people: where are your other network TV Dslr examples for comparison? Buh…image sure does look a bit soft…at 480 freakin’ P!!! b.sheer is right. Why are so many dinks making comments off skin tones and banding from a freakin’ YouTube clip?? Is that how you’d like your own production image quality to be judged: from an SD-res YouTube clip? I sure as heck wouldn’t want my images judged so summarily from that. Kinda makes me wonder if you actually know what you’re saying, getting that in depth technically with an FLV file that’s only 480p at its max! 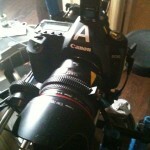 Using a 5D on an ACTUAL show/or movie is a positive move forward! I imagine RED users must have got SO excited when some of the first RED-filmed features came out. Now RED is less of a freak camera, and more of a viable production option, even for Hollywood. This is GREAT NEWS people! High end production people, the working pros who made House, have the ears of the industry and engineers! Their complaints will be our new Canon updates! And at least wait for an HD version of the show (and hopefully not crappily compressed in FLV at that) before you pass such critical judgment. While I’m not a 5d fan for big productions I do think that Greg and Gale will pull this off in exactly the way they envisioned it.Although I do worry that it will actually set the bar too high in production values, the vast majority of people do not have access to talent like these guys, grip, gaffers, professionals at the top of their game. Although saying all that I am about to start an edit on a documentary shot on Canon’s that couldn’t have been made any other way. Everything is a tool people, don’t use it because its the latest cool thing to use, use it because it suits the production. I’ve recently had the joy of being on a set (As a visitor) that was using RED, 16mm 1dmk4 and a D3s, because each worked for its own specialty. I think the focus and camera work in general was exceptional in establishing the chaos the scene needed. The shallow focus draws you in to the detail and tells the story without dialog. I’m sure the aired version will be exceptional HD quality. I’m looking forward to the episode tonight. Can someone fill me in briefly on what ‘House’ is about? So, on the technical side of things…we are looking for extreme DoF shots, shots in positions or places that are not possible or extremely difficult with traditional gear, ‘movement’ shots that aren’t typically possible with the bulkiness and weight of film cams, and low-light shots…..
What other kind of shots are we looking for just to analyze and appreciate what HDSLRs can bring to the table for a major prime-time show? I’ll definitely record it and review. I normally do not post on Blooms website but I have to say that the Canon is not ready for primetime yet. The resolution is not high enough. It looks like you are looking at a watery higher end video camera…that is not good. It needs to look like the tv shows like White Collar or Southland…this doesn’t. I noticed this issue with SNL’s try at it. It’s not ready yet. wait till it goes out sir then make your judgement. wait till it goes out then make your judgement. Seems odd that they all think it is ready. Everyone I have worked with think its ready. i dont see what you see am afraid! Wow, it’s beautiful. Great cinematography. Can see why they needed the camera in some of those shots as well. And as I was typing this, the leg…geez! Watching now and within first 5 minutes already was aware of focus pulling and more than obvious shallow depth-of-field in action. Overall, I’m enjoying their exploitation of lens selection, no doubt chosen for shooting in such tight locations as this storyline is dictating. And as for quality, it’s looking damn good! I might’ve sense a tiny bit of rolling shutter in one or two quick pan shots. Maybe a bit more noticeable noise (I like to call it film grain 😉 but the episode is holding up just fine on my 50″ plasma HDTV. Unfortunately I am watching it in non-HD, yet on an HD tv in the hotel in Connecticut I am at tonight, but this looks really good. I honestly would have had no idea this was not shot on film like the rest of their episodes. Obviously the lighting is great, which helps, and the sound is great, which helps, but I can’t see any of the shortcomings of these cameras (image wise) appearing on the broadcast. Maybe the HD broadcast (which I’ll see when I go home) is more telling, but if overall this was cheaper or easier for the production as a whole then they should continue on this route. The cinematography is stunning, regardless of the format, and 99.9% of the viewers would not notice a rolling shutter problem if it came across. Utterly gorgeous – little bits of issue here and there, but the average viewer would never see it. The noise was distracting on one…maybe two setups? Otherwise it looked clean and great. The depth of field was a little too shallow for me on some of the bathroom scenes at the end – but that’s just a personal preference. Here’s the most important thing though…story trumps all. It was a brilliant episode of television, incredibly well written and meaningful. The beauty of the images on the screen only increase the beauty of the story. It looks great to me. Different noise than I’m used to on TV, but I don’t mind. Beats my 7d so I can’t complain! Must keep lenses, lighting and pro sets in mind, not to mention the talent of all the operators, but honestly…I don’t see a single downside. Awesome work. Wow blown away great episode, very epic. 5D looked fantastic. I thought the episode looked fantastic. The last scene with the close ups on the pill bottle and facial features was amazing. The only thing I noticed was the color and visual mood shifted a bit much in the bathroom scene from the close up shots to the hallway looking into the bathroom that it was a bit distracting, but this is picky stuff. The depth of field was just right. Not too shallow, not too deep. Great storytelling. Unfortunately I had to watch it in non-HD as well, but was still very impressed. Shots looked great especially the closeups of hands and faces in the final bathroom scene. The shot that sticks out the most in my mind is when they arrived at the hospital and discover the paralyzed woman had died. 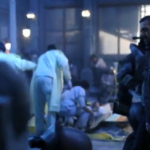 Where the camera is shooting out of the ambulance into the hospital and Omar Epps is the only character in focus among everyone standing there. Any guesses on which lens was used for that shot? An another note it must have been convenient to shoot those underground scenes with a DSLR! I was worried about the focus in the opening scene, but those problems seemed to go away once things got rolling. 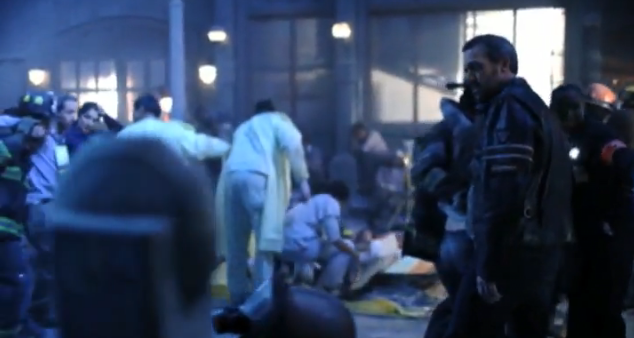 I also noticed a small amount of distracting noise in two setups: a red medical bag and Curry’s face near the end. I saw no jello, tho they might have been avoiding whip pans for just that reason. The grade was a bit heavy on the orange/teal emphasis but that’s just the look. DOF, low light performance, resolution, all wonderful. Great episode too. Amazing work! 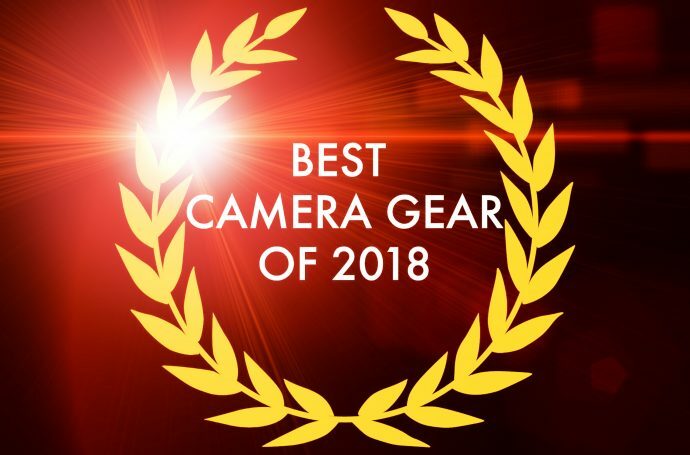 Kudos Greg for putting this cam to the test on your show. Colors were awesome and better than I was expecting. I’m with JCole that on some of the shots the ultra shallow DOF was distracting, an opinion. On the Brizzly picnic Greg indicated that one shot was on film. Taking a stab and guessing it was mad dash down the hall to the ambulance towards the end. If not and that was the 5D, first look seemed great…will have to watch again. Looked great in Chicago on Fox’s 720p over the air HD broadcast. I thought the shallow depth of field helped to convey the claustrophobic nature of the episode. I had to keep reminding myself to pay attention to the camera work. There was nothing distracting about it in my opinion. I thought the 5D really performed well. Beautiful cinematography overall. A pleasure to see what the 5DmkII can do for an extended period of program time in a single camera dramatic television format. The DSLRs are tools for telling stories. Our cameras have been done a service because of talented writers, actors, and a skilled crew. Most people don’t care about compression or rolling shutter. They want to feel. They aren’t pixel peeping like us nerds. I will admit I started watching this episode for the picture, but somewhere along the line I was genuinely concerned about that young woman and House. For the record, I thought it looked great. I am gaining the ability to identify the 5D based on visual quality. I mean that in the most positive way. The naysayers will nay, and we must remember that change is rarely well received. P.S. True Blood is next. It has been confirmed that the production team rented two 5Ds. A Canon signature was written on the emancipated cinematic House finale. We will only march forward from here on out. I saw it in HD and what I saw looked incredible. This goes to show that great storytelling can be accomplished without super-expensive cameras. 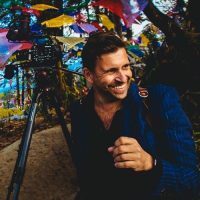 DSLR cameras with video capabilities unleash possibilities for creative storytellers that wouldn’t otherwise have the resources to bring their visions to fruition. Beyond that, this House episode shows how valuable these cameras can be even for bigger-budget productions. That being said, the cinematography is only a small part of what made this House episode work. Good writing, production design, sound design, and editing contributed equally. 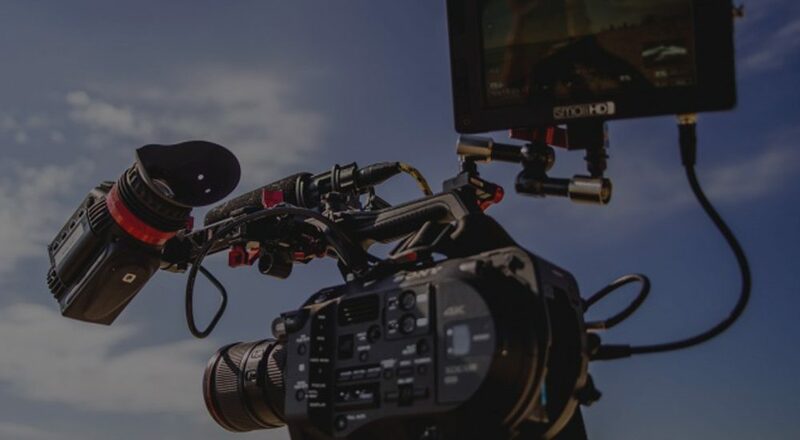 Nonetheless, this episode proves that if all of these things are done well, there is no reason that a DSLR camera cannot be every bit as effective (if not more) for certain types of filmmaking than a camera 10 times the cost. And a couple of the close-up shots reminded me of “Venice’s People.” They looked awesome! They just did a great job of mixing it up! In what timeframe does itunes usualy pick up a new episode? Great overall episode. Watched on HD on a 42 inch plasma. At first the overall broadcast did not seem to have enough contrast compared to commercials, and other show promos. But honestly, the story was so great, I forgot this was shot on a Canon DSLR which is a good thing. The rest of the family did not notice anything different about the episode. Loved the shallow DOF on the final scenes. Superb example of what can be done. downloaded it a few hours ago on iTunesHD and just finished watching it on the flatscreen. very nice photography! As a big House and DSLR fan this was an amazing evening. …such a geek. It did have a little of that “digital” look but I’m not sure if that’s from transmission of the compressed signal or a result of using a DSLR. On a big screen HD TV everything looks a bit digitized. But everything else looked amazing, it was all shot in a very cinematic/film style, lighting was great, angles, composition, etc… was what I expected from the show. I recorded it so I can go back and watch it more in depth. Saw most of the episode, looked really great. Definitely a different look than ‘House’ usually has. I am a huge fan of how House is shot normally, but I thought this episode had a unique look and really paid off. As with any great story I found myself a bit more involved in the drama as the episode went on and less involved with criticizing the camera! There were more wide angle / deep focus shots than I expected and they really held up. I’m sure the setups and set designs were made to utilize the strengths of the camera, but the wide shots really looked good. Many situations for banding and such throughout the episode, but I couldn’t see any on my TV. Gradients were true and contrasty edges really looked good too. I’m sure a lot of this is due to the post processing done to the footage. Some of the close up shots were really wide open and had an “eyes in focus, cheeks blurry” look to them. There were some stylistic choices made that I didn’t feel worked, and had the House team shot on the 5dii for an entire season I’m not sure they would continue to shoot this way, but isn’t half the fun in trying new things? As I said, the story of this episode surpasses the sensor it was shot on, but the camera really holds up to the point that you forget about it, and isn’t that the point? Comcast is killing me. The HD version of Fox is out. SD looks good though. I thought it was my provider, here, (Arcata, CA) too, but it’s actually the local broadcasters. Anything HD in prime time is blocked locally so they can run their local commercials. I saw fast pans at the beginning of the episode (crash scene), how come they didn’t have an issue with the rolling shutter? Just watched the season finale, in HD! I stick to my earlier point that the color rendering on the skin tones is very unique to the 5D. The wider the shot the more obvious the flat skin tones become. No sure why the camera shoots like this, perhaps is the lack of color information in the compression. But overall quality was amazing and times I couldn’t believe that the this was shot on the 5D. This is the real revolution, not the RED. Hats off to the focus pullers who managed to focus in SD on the field. Their work was impressive. As expected they took full advantage of the shallow DOF the 5DMK2 will give you (scene with pill bottles in hand). The compact cam seemed to be useful in such “tight spaces”. I would like to know what rigs they used. Not a big fan of the show. The season finale was very compelling. Great story telling which is fairly consistent with the “House” series. The show looked great and the DSLR aesthetic really worked wonderfully for this episode. Realizing the difficulties in focusing with that 5DmkII sensor, and realizing it’s subjective, I rather like the way certain shots fall in and out of focus. That may not be practical for all situations, but in this episode it seemed to add to the claustrophobic nature of the setting. I think this episode is a win win all the way around and as many are predicting, believe it will open up a flood gate in terms of “acceptability” for long format narrative material acquired on these DLSRs. Kudos to the “House” team! And thank you Philip for keeping us up to date on this exciting revolution! First I must say the story and cinematography were excellent. Story is king and I think the writers did a great job of bringing this season to a close. 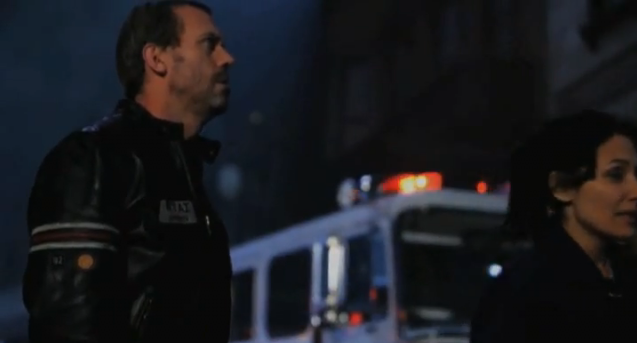 The thing that fasinated me the most was how this episode looked just like every other episode of House I’ve watched. The most obvious difference was the amazing use of shallow depth of field that the 5D can provide. I think they used it in a very effective way. In my opinion it was just enough. Others will disagree, but I liked how shallow DOF was used in the closing bathroom scene as an effect. I must say I can’t wait to buy a 5D. I’m sold. It looked…like a normal TV drama. Which, of course, is one of the best things you could say about it. The 5D did just as well as the cameras they usually use, which I’m sure cost far more. it was a great episode, though a bit gruesome at times. I’d be interested to know what lenses where used? Cinema or L? There were scenes where the focus was on the subject & not the entire scene…which I actually prefer, also would be interested to know about the light & color differences. It was a fantastic episode. Both the story and the fact it was shoot on the 5D. It made me claustrophobic, specially when House was climbing into that hole in the rubble. The scenes that really standout for me was not the claustrophobic cave’s and distraction, but one at hospital and at Houses apartment. Over all it was an amazing episode that went by in the blink. I was sitting on the edge the whole time. So if there wore any out of focus shots I didn’t notes. I would love to hear a fallow up podcast with the creators of the episode. Simply and utterly amazing. My wife and I were so excited to see this finale episode. We are huge House fans and absolutely loved every minute of the finale. The dof used was incredibly shallow, and we saw that the focus pullers were having issues, but still did a phenomenal job. I would like any crew try to get an Arri film camera in those tight spaces, simply not doable. This camera has already taken off, and now with a major tv show implementing it into their arsenal, who knows what’s going to come next. All we know is that we are both incredibly excited and can’t wait to see what the future brings with this camera! I never watched House, but I liked the episode. It was very wise to use the 5D to get into the tight spaces. Some shots, (80mm?) seemed overly blocky/contrasty, but most were nice. Some of the finer detail was lost in the image and seemed softer than it ought to have been. The macro shots with the pills were surreal and very intimate, but it was a bit too much for my tastes with the medium shots where one eye was in focus and the other was a blur, a bit distracting. Some shots seemed to have too much barrel distortion and needed cropping, but that could be that I’m just used to watching 35mm footage. And I’m not a fan of the wobbly handheld shots. Now that I got that off my chest, I watched it in HD and it looked wonderful. 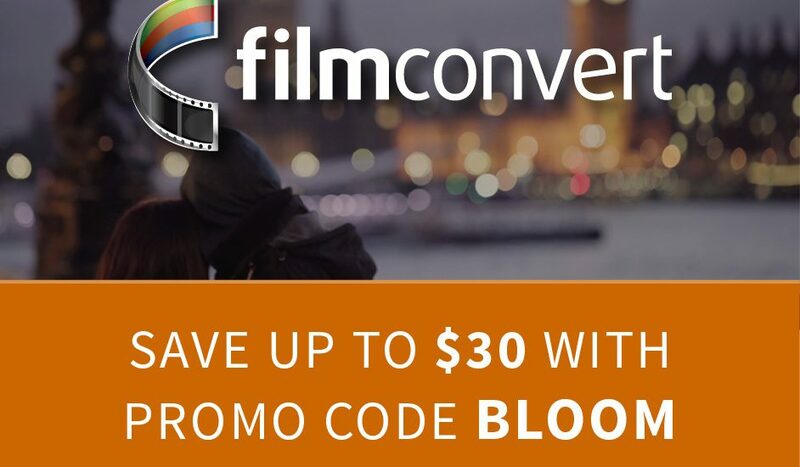 It’s not as rich or as dynamic as film, but you’re kidding yourself if you thought otherwise. These are great tools to be explored. can’t wait to see it!!!!! Any way for us europeans to get to see it? will you discus this in Toronto at Vistek in June? Look forward to meeting you there. I can’t say I’m a fan of the show, but I’ll watch this episode because of the 5D2. Great show this was the first time i watched house and it was a great show. Great story and the look was incredible! Great job with the DSLR. I skipped a meeting last night to watch a TV show I am not a big fan of. The set designers have to love the 5D. In pre-production meetings they had to learn they could build compressed sets and spend less time moving objects for lens on a shot by shot basis. The cinematographer is far better than anybody here, so I will side with his choice of lensing and the character of each scene and shots. I believe they used a 5D for main shots and 7Ds for coverage. As for teli-cini work, the cameras have nothing, whatsoever, to do with skin tones – that is totally decided in post. Of course, WB plays into in initially but the light latitude was good enough to color correct any which way. All in all I felt it was a beautifully shot story. This 5D has brought my career full circle as I return to cinematography after a career ad agency creative director then commercial director. I sense this system and mind set will only improve as more and more veterans and experimental enthusuiasts push the envelope of dslr filmmaking. Like an idiot, I ate dinner early, and told my DVR to record the HD Fox channel that my cable provider “PROVIDES”. As I was nodding off about 45 minutes before the episode started, I told myself not to worry and checked the recorder just to be sure. Found out you can watch it online (probably 720p) in a week, but… that was the whole point: to watch it in full HD (1920 x 1080i) on my 52″ Sony. Anyone know if they will re-air this in HD on another channel? USA Network, maybe? From where have you downloaded the movie? I thought it passed with flying colors! I’ve watched House for many seasons and I feel the look (color grade) was right in line with the House look. I watched the episode on my 73in. DHDLP in 1080. I think I saw a banding shot just once. I’m still looking for any aliasing, but I’ve found none. I do think they should have used a 5d and a 7d though. A few shots just had too little DOF. He could have used the shallow DOP for some impact shots, but there were scenes where the shallow DOF was a bit too much. Aside from that, the episode was great as a House show, and a 5d show. Proves the darn camera can be used for major productions. Now, Philip…If you can dig out some of the workflow that they used. workflow is documented on the brizzly picnic post from couple of weeks back. I realize that philip, about stopping down. But when you stop down you either need to increase your ISO or light more. My thought (aside from the HOUSE episode) is that you can keep the same exposure and lighting if one where to use the 5d and 7d together. I have the 5d, but I turn to my 550D more often than not for better control of DOF while maintaining the same levels of ISO and lighting. Keep up the great work Philip and come back to LA for another meet up soon! But that’s point. These cams are so sensitive just put up the ISO and stop down. People don’t have to shoot wide open. Red tails we shot around f11 most of the time. About as shallow as a z1! You can watch it on Hulu in a few daze…. brizzly picnic post ?? ?…sorry can’t find it..
what was the page and date of the post. Not surprised at the camera..remeber this ep. got same telecine treatment all the filmed ones did. everything covered…sadly..they don’t even know it. Not sure where my comment went – but I thought the episode looked absolutely gorgeous! Would not known it wasn’t film – superb work from Gale, Greg and the writers and actors all around. Philip, I followed the brizzly picnic but there wasn’t much info on the post treatment. Wondering if you can find out if grain was added or what else was done to achieve the grade. Looking forward to your visit to Toronto. As far as I’m concerned, the debate is over. DSLR’s are fully qualified to push pixels through TVs. There were times in the very darkest shots when I thought I could see noise, but it looked like exactly like film grain. 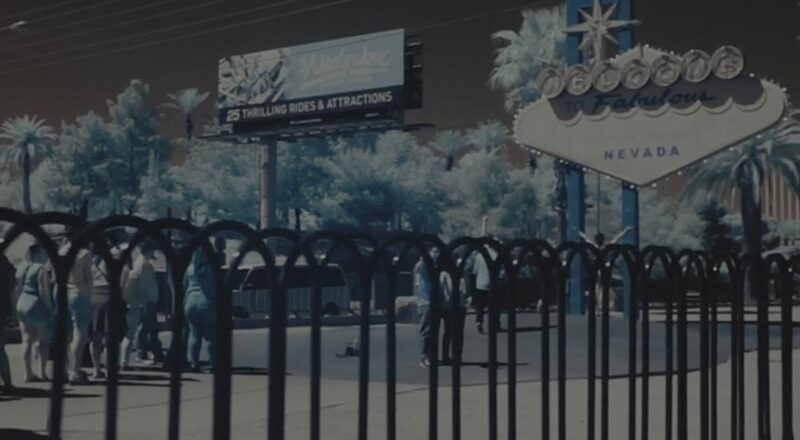 I definitely saw noise in a few of the “underground” scenes – vertical blue bands of pixels (best I can describe it) in the very dark parts of the frame. It’s what I ususally see with high ISO footage from my 7D. For what it’s worth I saw the show in HD on a Pioneer Elite PRO-110FD in Pure mode which is as close to the original content as it can be over a compressed cable TV stream. Great work, and I can’t wait to see more! Great show, more will follow no doubt despite the mild production pain any pro crew will feel shifting from 35cine to DSLR’s The images are WELL worth it and is just another shift towards full frame being the new standard. I have to ask what is on the velcro covered block on the hot shoe that the bubble level is stuck to ? I’m wondering the same thing. What the heck is the velcro block thing? But it’s got me searching for a hot shoe mountable bubble level. I hope I can find a multi-direction one though. Notice he’s using RedRock Micro rails and follow focus. Marshal monitor, no doubt for the peaking ability of the monitor. I wonder how he felt about the low res output during recording. I really need to listen to his interview with Phil. 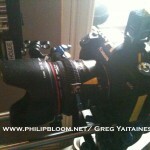 I just heard a rumor (I think at Canonrumors.com) that the next season will be shot with the Canon 7D and Zeiss glass. I don’t know whether I’m allowed to post the particular IP adres, but it works perfect in The Netherlands! If you’re still reading this comments section Phillip, do you think that the same sort of quality could be obtained by using a 7d (with the proper lenses, lighting, techniques, skill, etc.)? And why do you think they went with the 5d over the 7d. Is it the full-frame sensor or are there some other advantages that the 5d has over the 7d for professional camerawork? One quick follow-up question: Is it the full-frame sensor that allows for the super shallow DOF instead of the 7d or something else? YEAH MAN!! Watching right now- (Gotta love DVR’s). I happen to be both a fan of the show (HOUSE) and of the HDSLR movement- so this is fantastic. Love to see these little beasts being put to work in prime time!! They’ve done a good job of matching the look of the shows prior, however the premise and locales in this episode are far different than shows in the past – which seems a perfect opportunity to try something ‘different’…like their entire arsenal of cams+workflow. 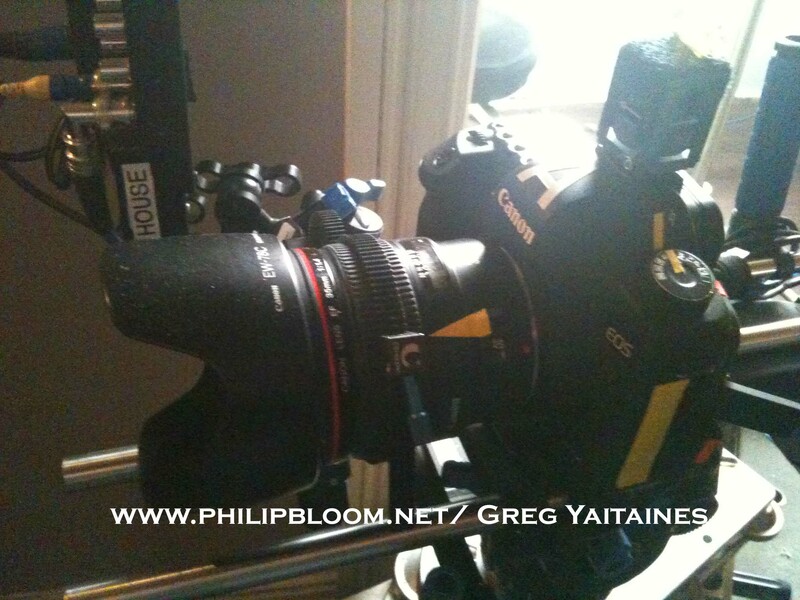 I have a Panny GH1 myself but I’m cheering on the 5DmkII– GO 5D GO!!! 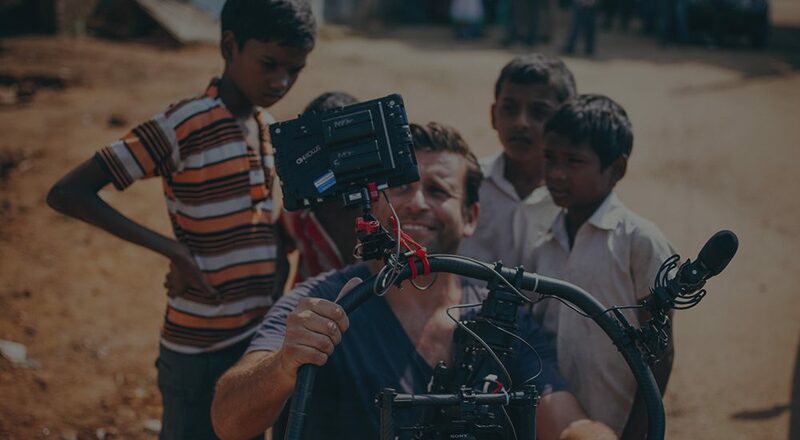 What is the small rectangular box attached to the Canon camera marked “A” in the first still? The obvious web-compression issues aside, it looks great to me. I certainly never noticed any rolling-shutter skew whilst watching it. I think, as shooters, we all get far too caught up with issues of ultimate image quality. You have to ask yourself who watches these shows, the answer is the general public – and I can promise you they no nothing of banding, rolling-shutter skew, slightly less-than-perfect focus pulls etc. they watch these shows for the stories, and if you’re telling the story right, minor problems with the video simply aren’t noticed. It’s a simple case of “good enough”, so long as the image is good enough to not be actively distracting to the audience, you really have nothing to worry about. The nail is in the coffin. 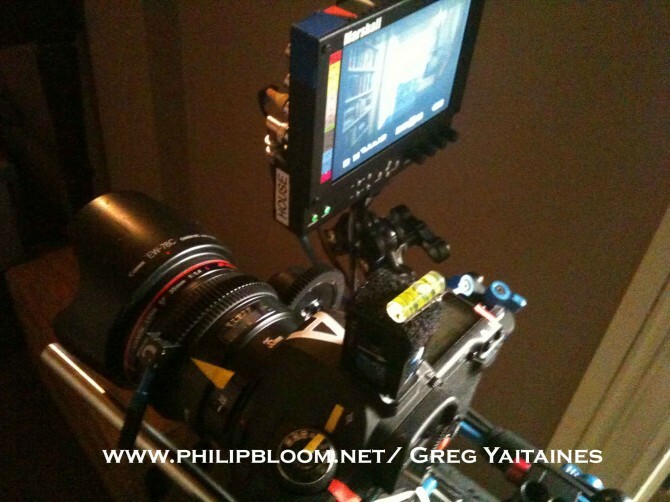 Just caught the episode in HD and without a doubt we will be using four of these cameras in July. Just saw a 720p version yesterday. Does anyone know what ISO(s) they shot at? I’m sure they didn’t use the same ISO setting for every shot, but I’m wondering if there’s one they tended to use more than others. I watched the episode on TV when it was broadcast and again in iTunes. I thought it looked great. I did notice a couple quick instances where focus went slightly soft, but it didn’t distract me from the story. And I’ve got to respect the focus pullers for doing the job they did shooting at such shallow DOF with still lenses, to me that is impressive. 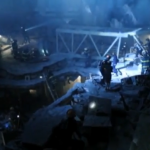 I’d love to see some behind the scenes stills or video on how they constructed and lit the set for the collapsed parking garage. I know they used a lot of construction lights as practical light sources, which is awesome, but I’d want to see more! By looking at it I would guess they stayed at ISO 320 or lower because it was just ridiculously clean even on a 52″ LCD, but who knows? Anyone catch that piece of info during one of the interviews? Rather than continue with the technical discussions, I’d like to add a comment from an editors pov. I finally grabbed it of of iTunes and began watching ready to analyze everything. About 10 minutes in, I was so absorbed with the intimacy and story that I forgot what I was looking for. Further along, about the 4th or 5th time inside the “wreckage” I felt like I was there. This was the most remarkable part of using the DSLR’s – I wasn’t distracted by anything. To me, that says it all. Definitely a great tool for telling stories – which is why we’re doing our art to begin with. Then I laughed at the thought of shooting similar work on film, or even a varicam – good luck! I was blown away. Thanks for the blog Phil! Now, back to work. If you only had £3000, what would you get? I love House to BTW but finding this season a little slow and lacking. Downloaded and watched the episode last night from iTunes. I was very impressed and entertained. For a while I was watching to gauge the quality of the 5d,but then I got lost in the story telling and just enjoyed the show. I will probably watch it a few more times. I am wowed at the 5d capabilities. 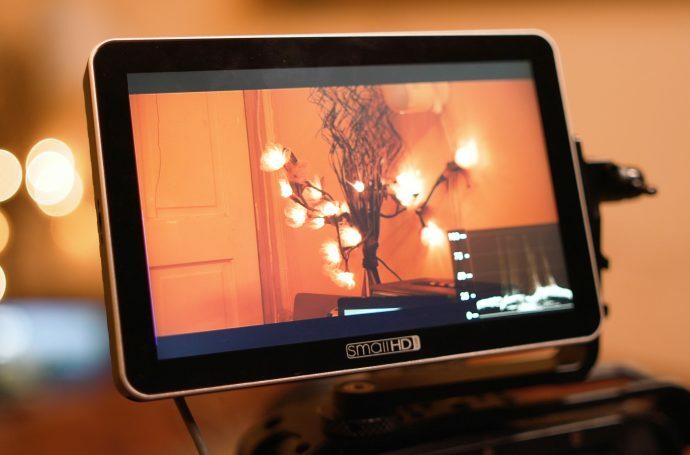 As a 5d owner I look forwarded to learning more about lighting and sound for video/film. the HD files were passed around internally as 4:4:4 DPX’s. there are banding artifacts. I am guessing by the look of the material that the Canon is aquiring *and* encoding to h264 using only 8-bit math, because an 8-bit image isn’t necessarily the problem, but an 8-bit image manipulated in 8-bit space, ie without proper bit rounding, is. 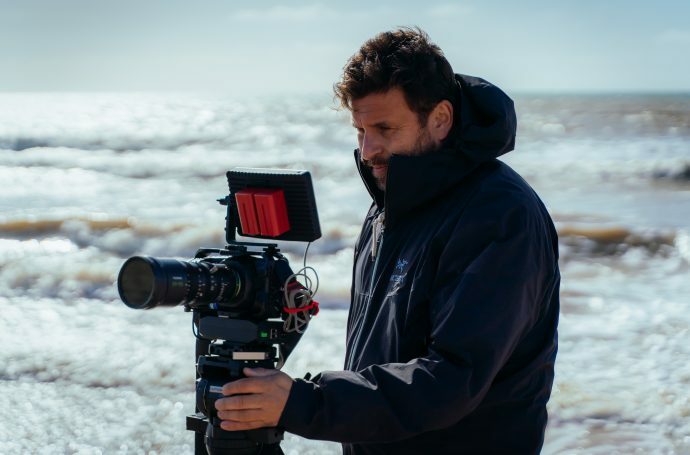 That said, I am awed by DP Gale Tattersall’s ability to have captured images that looked as great as they did – proof that even a prosumer kit can yield amazing results in the hands of a real pro working with a first-class team. We added grain to all the footage using the Foundry FurnaceCore plugin set, just enough to obscure the banding and I ran the grain plug-in through a keyer so it was only applied to mid and hi luminance portions of the frame that needed the treatment; this kept the dark areas from looking too grainy and was a better solution than “debanding” plug-ins. Does anyone know if there will be a full HD version up someday? Its hard to talk about compression now and pic differences and play other stuff on other plays and sing its merrits. Its obvious that its both beautiful and horrible at once. I guess that’s its charm and the possibilities really capture the imagination. I love that Greg and Gail & many more I am sure have really pioneered this in the mainstream. It makes me feel like the early days of RED and look where that has taken us. RED was a joke not 5 years ago and now its a player and with this 5D I ain’t hearing much laughing. Its not perfect by any means, I have been battling with its limitation on a daily basis but where I struggle is where it fits in what I do.. this skews everything I know. Its good, its good to be pushed into new places and to think beyond we are meant to. Lets see if this has legs. Thanks Phil for getting this info to us, not even 5 years ago, this sort of sharing was unheard of as freelancers kept all their little secrets to themselves. Thanks for the additional pics Philip! Which Marshall monitor is that? Beautiful. What camera they used for the previews episodes? I wish I could buy you a pint, oh well maybe next year! My question is, how in the world did they deal with moire? I didn’t see a single trace of it anywhere. Anyone out there have an answer for this one? I’d love to know. i can noitice in this House serie blocky noise patterns in flat colors which canon 5D and other canon dslr cameras have in their video codec.. it is very very big problem..
i have canon 550d and it records on 45 Mbit/sec, but the video codec quality is much much worse than my canon hv30 with 25 Mbit/sec.. actually all the canon 5D MkII, 7D and 550D models, have the same problem.. these cameras records video on ~42 Mbit/sec, but video looks like it has only ~15 Mbit/sec.. for ~42 Mbit/sec video should look very detailed and flat and dark colors on iso 100 should look great, but it doesn’t, because the colors is full with blocky noise pattern.. I am very sad about this, because mpeg2 and AVCHD consumer cameras don’t have this bad quality codec problem, so why should HDslr with 42 Mbit/sec have these problems??? where are you seeing this blocky noise pattern? From the broadcast HD version watching at home? 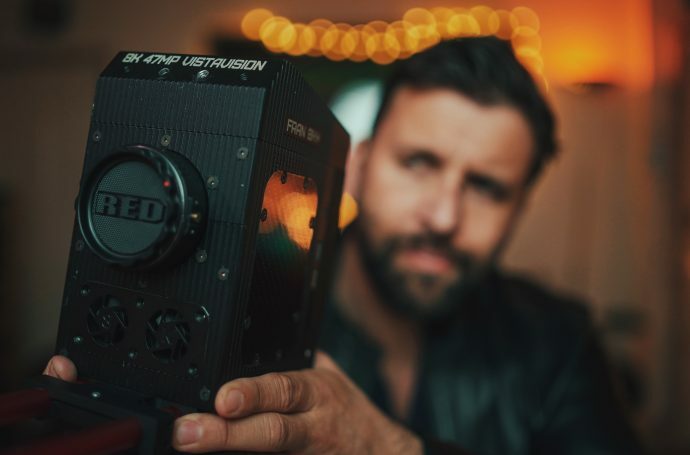 Why has 5D shallower depth of field than 35mm film camera? How is this possible? The 5Ds sensor size is the same as 35mm film frame, right? I see. I thought full frame means 35mm size. Got to see it on my Xbox live Zune player. Didn’t stream it, I downloaded it. IT looked good! Some noise but not super bad. Hey, Philip, now after everything (Skywalker Ranch, Red Tails, Hanson, House…) I´m quite curious about YOUR preference. 5D or 7D? Well the House season finale finally made it onto SkyHD in the UK. I haven’t seen many previous episodes, especially in HD, so it was not really for comparison. I was a little afraid that the almost obsessive search for shallow DoF might appear a little “gimmicky” but that fear soon dissipated. 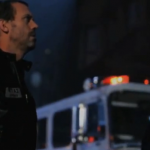 I think it fitted beautifully both with the physical claustrophobia of the story and with House’s mental state. Apart from the odd occasion when I would remember why I was watching, I was thoroughly engaged in the story which I reckon is just how it should be. Well done Greg, Gale and the House Crew. To me it ~was~ gimmicky. Talking about 5D cotent on TV, I just saw a few seconds of the Eyjafjallajokul volcano time-lapse video in a short montage shown in the preliminary round of the Eurovision Song Contest. Agreed, watched it on Sky One HD on sunday and was very impressed with the quality – very impressed indeed! Almost tempted to just buy a 5D MKII to play about with the video whilst I wait for Nikon to get their act together! The actors, storytellers and filmmakers have all put their egos aside to create one of the most moving pieces of TV or film that I have ever seen. Hey man, great blog and even greater job men!! congrats!! Do you know why the make the episode on a DSLR? I mean, was Canon tryin’ to get the format into the professinal market or was just an experiment of the Photographer? I just watched the season 3 premier of True Blood. 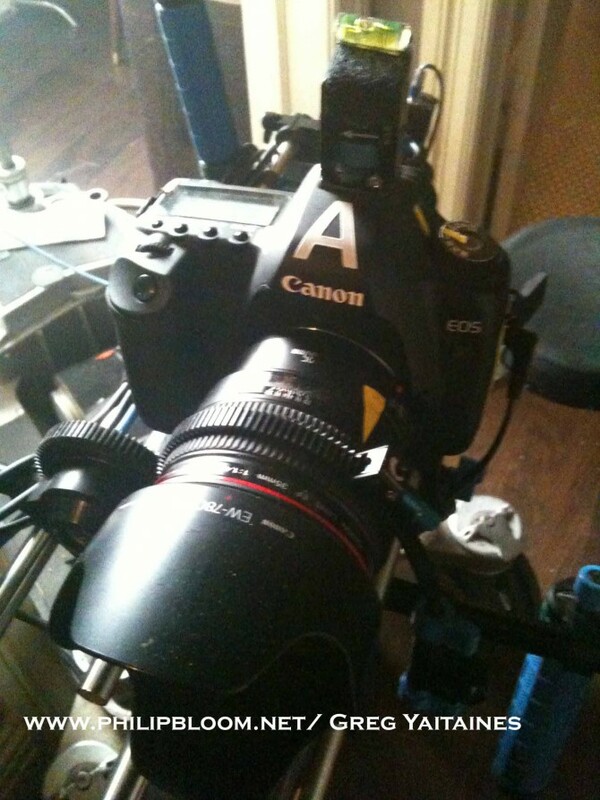 I thought I heard something about a couple of the show’s crew renting 5d mk II’s. Any news on that?